Paddy Considine makes a powerful and intense directorial debut with Tyrannosaur, the hard and at times harrowing – though ultimately redemptive – story of a self-destructive man and his relationship with a charity-shop worker. The bleak story and strong language may appear a handicap, but the film is a thoughtful, uncompromising and at times moving debut driven by quite outstanding performances by Peter Mullan and Olivia Colman. Actor Considine follows in a great British tradition of British actors choosing tough stories for their first films – such as Gary Oldman’s Nil By Mouth; Tim Roth’s The War Zone and Samantha Morton’s The Unloved – and he has delivered a dazzlingly intense film that is tough to watch but completely memorable and challenging. The film, which has its world premiere at Sundance, is not an easy watch at times – though much of the violent brutality actually happens off screen or out of shot – with the astonishingly fine performances making the film all the more sad and realistic. The opening scene sets the tone of the film. A drunken and raging Joseph (Peter Mullan) stumbles out of a pub, swearing and crashing around the alleyway, and proceeds to kick his loyal dog so brutally that it dies the next day. He is a tortured and tormented man, driven to drunken self-destruction and living a cycle of brutality and harsh self-absorption. 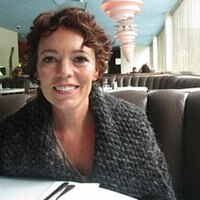 After smashing the window of a local post office he hides in a charity shop, where the Christian-minded shop assistant Hannah (Olivia Colman, in a moving performance) wants to offer kind words and support. He simply swears at her, but after being beaten up he returns to the shop the next day. Joseph is harshly dismissive of her Christianity, good nature and desire to help and criticises her for being middle class and knowing nothing of the harsh life on his estate. What she is hiding, though, is that she is being abused by her husband James (Eddie Marsan) at home, and her life is anything but perfect. Battered and beaten after an incident with her husband, Hannah seeks solace with Joseph, but he questions his ability to help and protect her. She stays at his tidy house where he talks about his wife, who had died some years before. His joke name for her was ‘Tyrannosaurus’ – describing her as a big woman who makes a lot of noise climbing the stairs, causing a vibration that made the tea in his cup quiver…just like the Tyrannosaurus Rex in Spielberg’s Jurassic Park. The film impressively spirals to a dark twist towards an unlikely sense of redemption for both Hannah and Joseph as they gently and falteringly fumble towards a relationship based on care and understanding. The revelation in Tyrannosaur is the moving and remarkable performance by Olivia Colman as battered wife Hannah. She is well known in the UK through comedy shows such as Peep Show and Rev, and had a role in Edgar Wright’s film Hot Fuzz as well as starring alongside Paddy Considine in Shane Meadow’s film Le Donk & Scor-zay-zee. But here she is remarkable and is complemented by an appropriately brutal and haunted performance by Peter Mullan who is at his very best as the embittered and tortured Joseph. Paddy Considine writes and directs impressively, making good use of the widescreen scope format to emphasise the bleakness of the estate where Joseph lives. He has created a tough and harrowing story that is punctuated by dark moments of compassion and humour and yet which offers a sense of redemption amidst the abuse and killing of household pets.